Mosquito bites at their best are just an irritating nuisance. When traveling, mosquitos in foreign countries can transmit serious diseases such as Malaria, Dengue Fever, Yellow Fever, Chikungunya fever, Zika virus and Japanese Encephalitis. A major part of managing these disease risks lies in preventing mosquito bites as many of them do not have any treatment or vaccinations available. 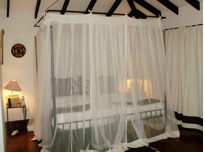 The use of a mosquito bed net is extremely important if there are likely to be mosquitos in your room at night. Various examples are illustrated below. The use of insect repellant containing a chemical called D.E.E.T on all exposed areas of the skin is important day and night. In heavily infested areas using clothing impregnated with a chemical called permethrin is important too. Do not rely on anything else including eucalyptus citronella, garlic and other devices. Ensure the repellant has D.E.E.T in a concentration of 22% to 30% even for infants and children. Its safe. Apply it every 5 hours to all exposed areas of the skin day and night. Apply any makeup, moisturizers or sunscreen first. The repellant should be the last thing applied to the skin. Apply carefully on the face to avoid contact with eyes and mouth. This repellant is not always easy to find in this strength in foreign countries, so please take some with you. Its readily available in most large super stores, hardware stores and outdoor recreational stores in Ontario.